Cebu Pacific Air is the Philippines budget largest airlines. It has dozens of flights in various Philippine destinations as well as in the Asean Region. Some of the international flights the Cebu Pacific serves includes Hong Kong, Singapore, Macau, Bangkok and Cambodia. Recently this airlines has come up with its very first long haul flight which is bound for Dubai. With its expansion and additional flights, Cebu Pacific is their personnel. Right now, there are in need of Female Cabin Crew, Chief Pilot for training, Airbus Pilots and others. For Cebu Residents who wants to be part of the Cebu Pacific family as a flight stewardess or a pilot, this is your chance to prove yourself as Cebu Pacific will be in Cebu this February for a job hiring. 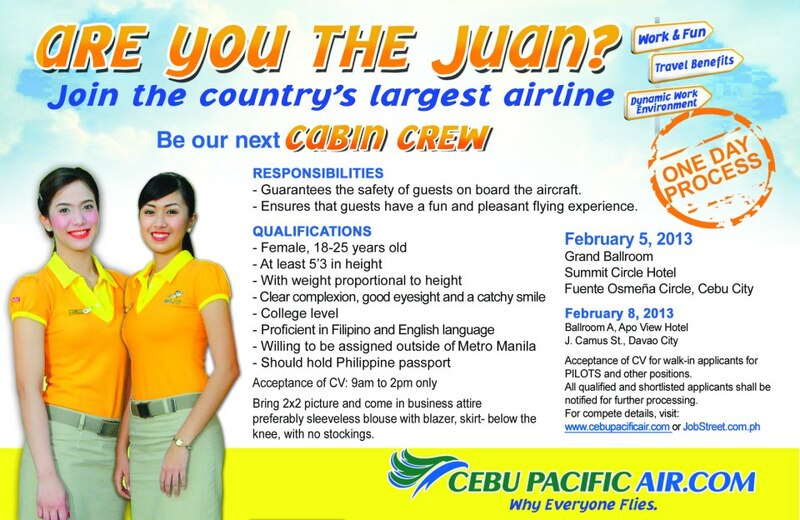 Those interested to apply for the position of Female Cabin Crew should submit their Resume or CV at the Summit Circle Hotel Grand Ballroom on February 5, 2013. Applicants are requested to come in business attire (Sleeveless blouse with blazer, below the knee skirt, no stockings). Applicants should also bring with them 2×2 picture. This is a one day event and will be held on February 5, 2013. Acceptance of CV is only from 9 Am to 2 PM. This is a one day event so better prepare your Curriculum Vitae and other requirements if you want to be a part of the Cabin Crew of Cebu Pacific and make your dream of becoming a flight stewardess a reality. The Cebu Pacific hiring team will also visit Davao on February 8, 2013 at Apo View Hotel. Like We LOVE Cebu on Facebook more Cebu News, current Events and the latest happenings in the “Queen City of the South“!!! hope there will also be a Cebu Pacific job fair here in Tagbilaran City, Bohol. Hi Kim, for now wala pa.. we will update this site if ever there will be new job hiring oppurtunities coming from Cebu Pacific. Thanks for reading We LOVE Cebu!! wala na po bang ibang available job na airport staff lang? Hi Janice, we will post additional job hiring articles in the future. Hope you can like us on Facebook to get updates. Thanks for reading We LOVE Cebu. wala po ba kayong hiring ngayong 2014? sa mga cabin crew? None for now, but we will post po as soon as new job offers gor csbin crew are available for 2014.
hiring po ba kayo ngayon for cabin crew? If there is po can you update me on my email and where can I apply? Thank you! Godbless!